We did not make it to New York for our normal July trip (due to Ed's then-chemo treatments), but we more than compensated in our recent journey during which we saw a record 16 shows in 9 days. As we have for several years, we are now sharing our takes on the shows; and we are hoping that you will all do the same when you make your way to NYC. Below you will find our ranked reviews for shows that are still playing. We also saw four excellent shows that have closed (or were only one-time productions). We offer our views on them at the end in hopes that you will have a chance to see them at some point on a stage near you. Even though we rank the shows seen, we did not see any show this year that we could not recommend highly. Sometimes, it is one person's performance the night we saw the show that causes it to be lower ranked than others. Other times, it is just our flukily preferences. But, we hope you can see many of, if not all, these shows either in NYC or when they arrive on tour or in local repertory. And you may want to know that these shows bring our 2014 total-seen theatre productions up to 90 thus far with 2.5 months to go in the year. A toast to my hubby who is a trooper. How many people undergoing six months of chemo could have done that? Ghosts of Gene Kelley & Frank Sinatra from the film version. Huge cast with amazing sets. Ballet-based choreography. Songs you either know or have somewhere heard. Lines of dialog you can say along with the actors. Laughter abounding with silly and poignant episodes. Even though I was seeing my 5th full production of Kander and Ebb’s musical "Cabaret" (including when Joel Grey reprised his role), I was left stunned and in tears as the final blackout came in this current revival on B'Way. Alan Cummings' ever-present emcee initially embodies a raunchy, yet lovable Puck-like character through the first half of the play. Increasingly in the 2nd act, he becomes both victim and perpetrator; and his final specter gaze and portrayal is an image that will be emblazoned in my mind's eye forever. The entire production is first-rate overall with the exception of Michelle Williams as Sally Bowles, who seems often to lack both the punch and the pitch to pull off this iconic part. The exception is her 11 o'clock number of the title song "Cabaret," where she knocks the song out of the park and leaves us with a haunting look of red-eyed horror as Sally finally sees the Nazi horror about to descend on her make-believe world. Closes March 29, 2015. If we had only seen one show this year in NYC, this is the one I would not have wanted to miss. "Here Lies Love" is a genuine hit that is about to explode on the national and international stage (slated to play on several continents in the coming year). First, the story is the Marcos/Imelda/Aquino drama many of us watched from afar in the late 20th Century; and the familiar faces, voices, and scenes come to life both in the actors and in the vintage video surrounding the audience on all sides. 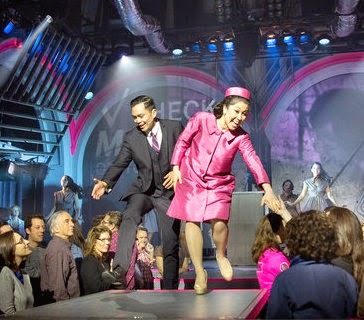 The show is an immersive theatrical dance club experience with a narrative, the life of a charismatic president’s wife, reminiscent of “Evita.” The music is pounding & pulsating ... and totally hummable as the audience leaves. The stages shift among the standing audience (who shift positions, too) -- an audience that becomes both the adoring and later protesting throngs of Marcos. Live broadcasts, actors on all four sides and in the middle, incredible music, a light show that never ceases, intricate logistics performed seamlessly, with every minute of the 90 counting for something ... all this and more make "Here Lies Love" a must-see. A national tour will begin in 2015 in San Francisco! Closes January 3, 2015. There are many reasons to rave about and love the 2014 Tony Best Musical "A Gentleman's Guide to Love & Murder." 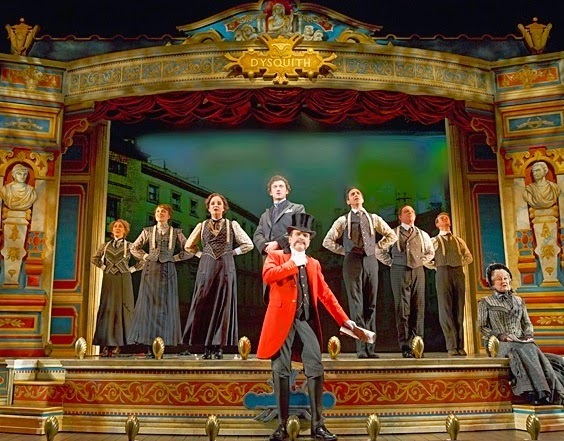 To me, the funniest aspect is that this very British-like parody set in 1909 London is that it is written and scored by Americans who are neophytes on the B'Way stage. Beyond that, seeing Jefferson Mays become 8 different members of the D'Ysquith family (all who will spend only a short time on stage before meeting their demise, usually at the hands of their distant cousin Monty Navarro (Bryce Pinkham)) is hilarious and amazing. Ed & I could only surmise he must have had 5 dressers working on him for his quick personality and total costume/wig/etc. changes (often in mere seconds, it seemed). This is a rib-ticker, for sure, and a musical not to be missed. Is it going to stand the test of time to be worthy of its "Best Musical" title? Not sure about that. I would have leaned toward "Beautiful" myself if I had been voting this year. But I totally recommend seeing it. There is nothing else quite like the silly antics and joyous murders occurring presently on the B'Way stage. 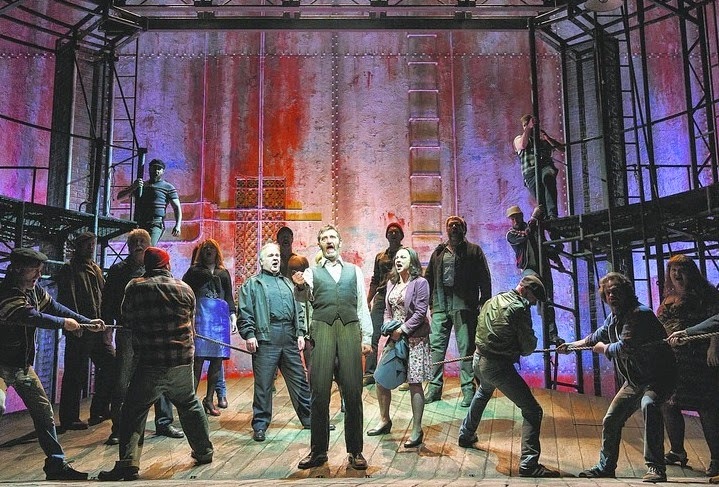 Don't go to "The Last Ship" expecting today's usual great-abs, little-clothed chorus boys. The guys in this show are burly, working-class (in appearance) and sing/dance with gusto, stomp, and ale-filled fervor. Sting's music has a Celtic flavor, is more "Once" than "Book of Mormon," and often captures well the flavor of the story and moves it along with zeal. Somewhat allegorical, often Biblical (think prodigal son seeking forgiveness, redemption, and even ascension to heaven), "The Last Ship" also is about many aspects of love, about regret, and about reconciliation. All this occurs in the framework of a suffering, poor community whose main industry and source of pride (ship-building) is dying but a community that defies death to seek its own, somewhat fantastical salvation. The packed, preview audience bought it. They appeared to love it. I really like it, too. Opens October 26. Open-Ended. 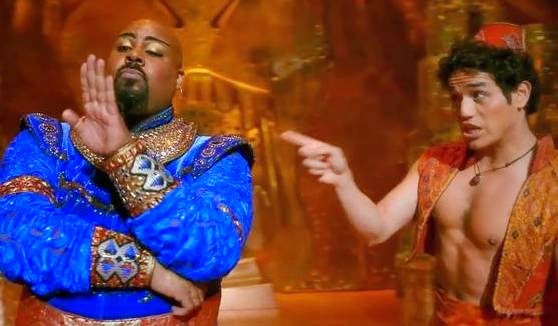 There are 3 big reasons to see Disney's "Aladdin." The huge production numbers throughout the show are over-the-top -- full of color, costume, and choreography. The magic carpet is a character unto itself, and I really have no idea how it flies. And the really BIG reason to see this show is our TheatreWorks pal and Tony Award winner, James Monroe Iglehart. As the Genie, he is beyond words. His unbounded energy, incredible dance moves, spontaneous wit, genuine heart, and powerful voice are all worth the price of the ticket. On the downside, the book is really sappy and at times, just bad. And Courtney Reed as Jasmine at times does that B'Way diva screaming a bit too much as she sings her songs (something we seem to have heard way too much this year, frankly). But the faults are far outweighed by the pluses. I am really glad we went to this extravaganza of a show. It was fun, fun, fun. Don't worry if you don't have a child to take with you. The kid in us all will love every minute. Open-Ended. 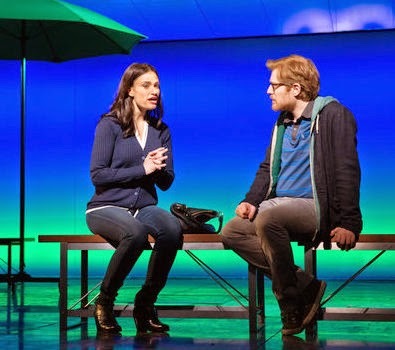 I am not sure I have ever seen any more complicated musical than "If/Then," and I doubt any two audience members left having seen exactly the same story and play. Idina Menzel, LaChance, Anthony Rapp, James Snyder, and more bring incredible voices to beautiful anthems and dynamic explosions of sight and sound as they explore 'what if' this happened or that happened or something else happened in one's life. All that imagining we each sometimes do in our heads gets played out in intertwining story lines before our eyes. The result may be confusing at times, but the effect is mesmerizing and moving. As long as Menzel stays in the cast, this show will probably have a good run. If she leaves, look for a quick closing. Open-Ended. Note: We purposely did not see "Beautiful: The Carole King Musical" (King, Goffin, Mann, Weill & McGrath; Stephen Sondheim Theatre) because we saw the world premiere in San Francisco. We would heartily recommend it and would have placed it far up on this list. Through a scheduling change by the theatre, we missed seeing "Hedwig & the Angry Itch" (Trask & Mitchell; Belasco Theatre), although we have also seen a couple, past wonderful, non-Broadway productions in San Francisco. Both are open-ended. Can you imagine laughing so much for almost 3 hours that exhaustion and fatigue is the outcome? Just look at this cast! 6 of the 7 are stars we all know from many venues, and the 7th being introduced in this production (Micah Stock) turns out to have some of the funniest moments in the play! 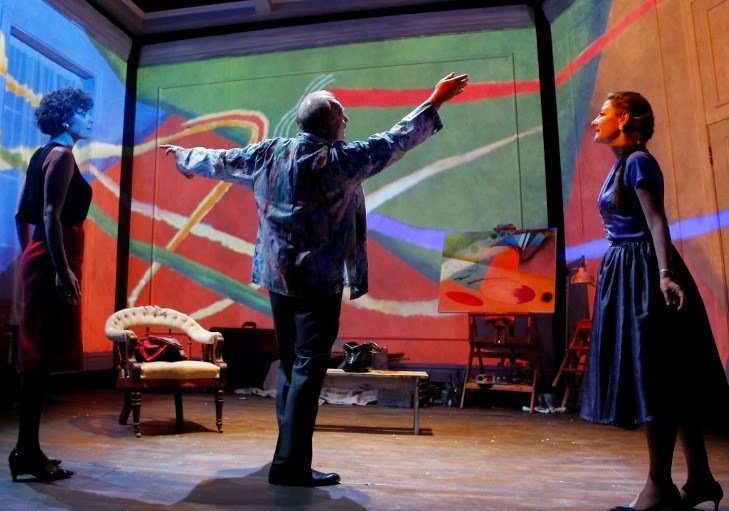 Set in the pent-house bedroom of a rich, first-time, B'Way producer, "It's Only a Play" is raucous, rip-roaringly funny, and often also very poignant. Each actor enters through the bedroom's double doors and stops the action of the play due to the audience's thunderous applause. Nathan Lane rips himself and every known actor/actress with a tongue that is sharp and biting yet lovable. Never have I seen any actress funnier than Stockard Channing is. 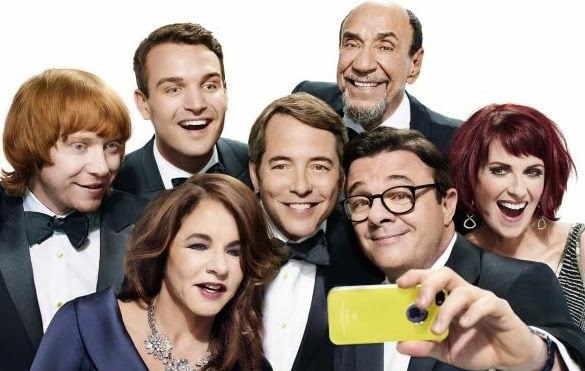 Matthew Broderick is perfect as the playwright nervously waiting and then tragically receiving the opening night's reviews. And I could go on and on about all the others on stage (F. Murray Abraham, Megan Mullally, Rupert Grint). Each aspect of the theatre (actors, directors, back stage folk, audience, critics) is satirized and sainted in this soaring tribute to the risks and follies of writing, producing, directing, and starring in live theatre. Crowds were begging for tickets the night of the last preview. Look for impossible-to-get tickets for this limited run. Closes January 4, 2015. Blythe Danner and a stellar cast shine in Donald Margulies' new, limited-run play about a family of actors. Like all families who gather together for a summer reunion, sh-t starts to happen. Secrets, old hurts, new bondings, unresolved issues, and fond remembrances all mingle into a delicious 2.5 hours that the audience really wants to go on for much longer. This is a play I hope a Bay Area group will pick up in the next year or so. Closes December 9, 2014. A few months ago, I read breathlessly the script of the 2013 Pulitzer-winning "Disgraced" (by Ayad Akhtar). Watching the words and actions played out real-time is almost too much to bear. Every ethnic button, every terrorist fear, every unspoken prejudice that we never dare speak even to ourselves is said, often shouted in yet another dinner-party-drama gone amuck. Further, the play even becomes more timely after the past few awful weeks of NFL spousal abuse inactions. Rarely have I heard an audience gasp in horror (and probable shocked disgust) as occurs at one moment in this taut, tight 85-minute drama. As audience, we are lured in to like and admire these five, very charming, witty, handsome characters. But one by one, each reveals aspects maybe just too familiar to too many of us. Can I recommend it? Is drama meant to cause unease at times, to stimulate questions and conversations, to lead the audience to reconsider personal shadows and unspoken beliefs? Then, yes. It is a play to be reckoned with. No, you will not leave feeling very uplifted. 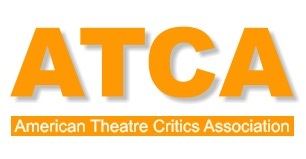 As our friend Jim Reber says of the purpose of theatre, "Sometimes it's just 'hold the mirror up to life,' and what we see isn't so pretty." Open-Ended. No matter how many times I see Lucy Ricardo in the chocolate factory, I die laughing each time. And, no matter how many times I see Hart's & Kaufman's "You Can't Take It With You," I still bust a gut over and again -- especially in Act 2 just before I know the Kirby family is about to ring the doorbell for dinner at the Sycamores', one night too early. This production lives up to the long line of hilarious outings of this 1936 comedy. Having James Earl Jones lead the cast of 20 as Grandfather is just the icing on the cake. The antics are many by the minute; the situations, zany beyond belief; the love of family, spilling forth throughout. And what is it about Grandpa's final prayer? Every time I hear it, I tear up despite myself. "You Can't Take It With You" is an American treasure that I personally treasure each time I see it. Closes January 4, 2015. "This Is Our Youth" returns us to our late teens/early twenties when everything seemed possible and nothing worked out, when one moment we were soaring on life and the next moment we were ready to jump the bridge, and when in a split second a best friend became the scorn of hormonal rage and the next moment, the closest thing to real love we had ever felt. Three young people in 1982 dance their lives together at rave-like, drug-induced pace in a NYC apartment as they insanely approach and avoid real connections. The comedy is both funny and sad. It reminds us all of those moments in our past that we could never imagine being our parents and yet can hardly stand to be ourselves. I walked away a bit bewildered and out of sorts. Nothing much is resolved. We as audience witness a slice of life that many of us had all but forgotten yet so quickly and deeply remembered. This is a play that deserves more attention and production across the land. Closes January 4, 2015. Ed and I have traveled coast to coast to see Audra McDonald on stage: Musical theatre, opera, and in concert. 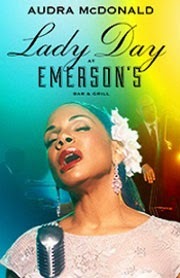 If I had not known ahead of time that the star of "Lady Day at the Emerson Bar & Grill" was Ms. McDonald, I am not sure that I could have identified the person on stage as she. Audra became Billie Holiday in every respect: posture, looks, language, and voice. Positioned as one of her last concerts, the musical invites us as audience to witness the painful demise of one of the greatest singers ever as drugs and alcohol win the ultimate battle. It actually hurt at times to watch what was so realistically happening before us; and at the same time, it was magnificent. We got a glimpse of how much Billie soared when she was totally on her game, and we saw what a tragedy she became toward the end. Did Audra deserve a 6th Tony Award for this performance? Oh my, yes. She probably deserved 6 Tonys JUST for this performance. I am not sure I have ever seen a better singular performance. We were lucky to see the closing night. I am sorry for everyone who did not get to see her perform in this wonderful musical, for I am sure that I will never forget the emotions -- high and low -- of being there. This has been "The Year of Lauren Gunderson" for us. The prolific and profound playwright raised the curtain on 4 SF Bay Area stages during a very short time in past 15 months or so. Our favorite, "Bauer," staged by our adored San Francisco Playhouse, made its way to Off-Broadway with its two outstanding Bay Area actresses (Susi Damilano and Stacy Ross) & its director and set designer Bill English, and was joined by B'Way stalwart Sherman Howard in the lead role (whom we have seen in all his past B'Way shows). We loved this production in SF; and with Mr. Howard, it was even better in NYC. I am a firm believer in telling the untold stories of history, and this is one of the most intriguing and sad stories of modern art history. The story portrays one of the most important 20th Century artists and visionaries for whom the Guggenheim Museum in NYC was built to house his art. German émigré and painter Rudolf Bauer was tricked by the fellow German artist and love of his life, Hilla von Rebay, into signing a contract that gave Solomon R. Guggenheim the legal rights to all of his paintings and any future works he created. Real-life family drama intervened, and his art in toto was condemned by Guggenheim's heirs to the museum's basement (some of which was finally sold to others over the decades to follow, some of which still remains in the basement). This powerful drama tells that story with exceptionally well-written and acted script and beautiful staging. Both times I saw this on both coasts, audiences left stunned, saying, "How come I did not know about this?" While closed in SF 7 NYC, this play should be appearing (my guess) all across the country and beyond in the next few years. "I Am Harvey Milk" weaves the story of Harvey Milk’s life – from boyhood to his rise as the first openly gay man to hold public office to his assassination. 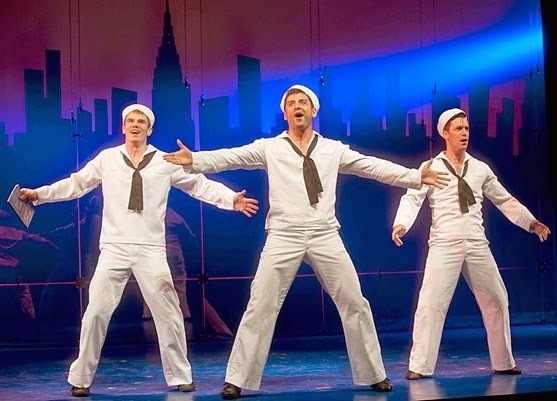 Part choral work, part theater piece, the show is an emotional celebration of an American icon. Having sung Andrew Lippa's "I Am Harvey Milk" in choruses of 300 (SFGMC's world premiere in June 2013) and of 550 (in LA this past July with LAGMC), I was not sure how it would be to sit in as an audience member at Avery Fisher Hall in Lincoln Center. In one word: Fabulous! I heard parts and sections I did not know existed. I was struck in new ways with new emotions about the power of Harvey's life and message. Kristin Chenoweth was over-the-top wonderful as Harvey's mother. Andrew Lippa once again sang with depth, heart and emotion. And the 125-voice Broadway Chorus (all professionals from shows on and off B-Way) was gorgeous in every respect. 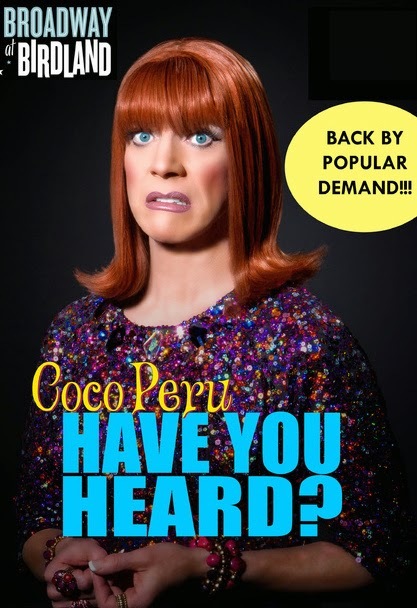 Reprising bits of her past, all-scripted shows from the past 24 years, Miss Coco Peru's "Have You Heard" is full of what she does best: telling stories. Touted as the best living story-teller by Lily Tomlin, Coco keeps her audience in stitches as she recounts events of her life. She also sings with a voice as wonderful today as I have ever heard it. She doles out advice as only she can and in the end, touches and warms your heart. We are privileged to know her and her husband Rafael, and I encourage everyone (gay and straight) to go see a show of hers when in your neck of the woods. Check out some of her videos at https://www.youtube.com/user/themisscocoperu. Along with the above shows, we saw the outstanding Jeff Koons exhibit at the Whitney Museum of American Art, which unfortunately closes this weekend. We also visited MOMA and the Guggenheim (the latter, a true disappointment -- for the third time in our visits to NYC). We eat only near the theaters, and this year discovered a new-to-us place where we ate twice and totally recommend: etcetera etcetera, 352 W. 44th. We also particularly adore Blue Fin on Broadway, where we also dined twice. Other places we particularly enjoyed included Bocca Bacco on 9th and Swing 46 on 46th.